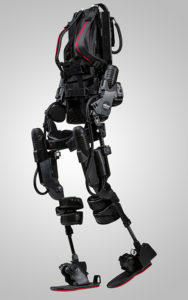 Exoskeleton technology has been a staple of science fiction for decades. Going back to 1986, the hit movie, “Aliens,” featured a climactic scene where Sigourney Weaver’s character, Ripley, famously dons an exoskeleton to fight off a terrifying creature. But exoskeletons are no longer science fiction. They are a health care fact, thanks to EksoBionics, which developed the EksoGT, claimed to be the first exoskeleton designed specifically for rehabilitation. EksoBionics touts its machine’s ability to help patients who have had a stroke or spinal cord injury regain mobility faster and more fully. According to Kristi Gibbs, manager of rehabilitation services at OSF HealthCare Saint Francis Medical Center in Peoria, the results support the EksoBionics claims. OSF Saint Francis is the only inpatient rehabilitation center between Chicago and St. Louis with the exoskeleton technology. With help from a former patient who wanted to repay OSF HealthCare for his lifesaving care, and the OSF HealthCare Foundation, OSF Saint Francis obtained an EksoGT and began putting it to use for patient care in March 2018. Using the exoskeleton, patients are able to literally and figuratively cover more ground during their rehab sessions. The results have been positive, too. According to Gibbs, patients who have used the exoskeleton tend to walk with a more normal gait once they’ve graduated to walking on their own. They’ve shown greater endurance, an ability to walk farther and are more confident in their abilities. The inpatient rehab team has also received positive feedback from outpatient therapists, who work with patients after they return home. The exoskeleton has not only proved itself to be beneficial to patients, it also makes life easier for physical therapists. The exoskeleton can handle doing much of the work physically supporting patients, which makes the job less physically demanding for caretakers. Thanks to the exoskeleton, therapists experience less fatigue and can push patients further. There was some initial training therapists had to master at first, but the team has really bought into the benefits and are now teaching other therapists how to use the equipment. Visit our OSF Rehabilitation website to learn about the comprehensive services we offer.